Somewhere in the quintessentially Californian golden hills above Stanford University, a giant physics experiment is quietly rotting. "In" is the operative word here; the behemoth sits in a three-story-deep, concrete-lined hole in the ground, sheltered in a warehouse-sized structure in one of the more deserted reaches of SLAC National Accelerator Laboratory's sprawling campus. Cars and trucks still park in the lot outside, bearing scientists, construction workers, and engineers to the lab's current big project, accessible via two entrances nearby. But this particular piece of physics junk is closed for business. A hulking steel beast seemingly overgrown with wires, this detector, known as Mark II, was once a microscope that could peer into the most fundamental building blocks of our universe. And it's only a small piece of the much larger experiment that made it happen. Although you can't see them, the two halves of a 2.2-km circular tunnel come together here. If you could turn the clock back about twenty-five years, electrons and positrons would be flying toward the Mark II from either side of the dank tunnel, coming together in a shower of exotic particles and radiation. The intricate family of detectors within Mark II watched and listened, sending data via its millions of wires to physicists who would then meticulously comb through the piles of numbers for some new clue to the universe's puzzle—the lifetime of the tau lepton? The whisper of "I'm here" from a passing selectron? I was reminded of the Mark II moldering spectacularly in its grave when I saw today's Wired Science photo essay about the death of another old and much-beloved big physics experiment in the Bay Area, Berkeley Lab's once-futuristic Bevatron. It reminded me of how much SLAC, Berkeley, CERN and other labs are massive, physical palimpsests, continuously reinventing themselves. Although perhaps most famous as the proving ground of an incredibly audacious plan to build a two-mile-long accelerator in the early sixties, SLAC's been home to a venerable family tree of acronymic experiments, each building on the infrastructure (tunnels, buildings, technology) and innovations of the previous generation. Mark-II enjoyed 13 years of use, though it wasn't always here in this underground lair. 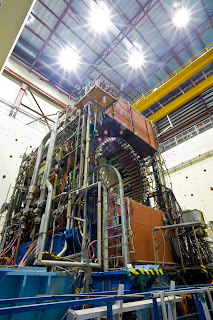 It started life in the Stanford Positron Electron Accelerating Ring, or SPEAR, in the heart of SLAC's campus, before it was moved* out to the suburbs. SPEAR hasn't just sat there either. 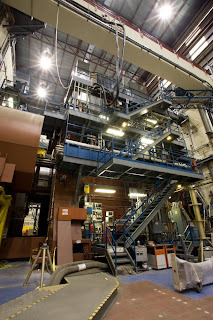 It's now a synchrotron, a factory for high-intensity X-rays. It's a hive of activity where a constantly changing cast of biologists, chemists, earth scientists, physicists, and even archaeologists probe the unseen in their fields. And while SLAC's linear accelerator is no longer a powerhouse of particle physics, its new incarnation as an X-ray free-electron laser (or "Giant Laser," as I like to call it, though it's official moniker is the Linac Coherent Light Source), soon to be capable of molecular movies, shows SLAC scientists are still as daring and ambitious as they were in '61. *"I mean MOVED, seriously," says Brad Plummer, who for the last three years has written about, snapped photos of, and filmed just about every corner of SLAC. "That's a big, delicate piece of hardware to be moving around. The trailer they put it on had 180 wheels." 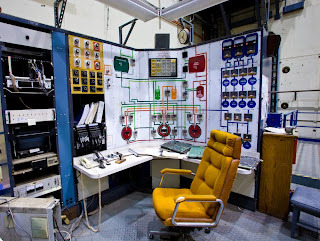 Thanks, Brad for these gorgeous photos of the Mark II and the hilariously retro control room for the SLAC Large Detector. For more of Brad's stuff, including technolust-inspiring snaps of the Giant Laser, er, LCLS, check out his website.